Yes!!! Organic Interiors, located between Guelph and Kitchener, Ontario, has adopted a creative way to capture the attention of Restaurant Patrons using Augmented Reality. This technology will allow customers to download an APP on their phone, in which their camera will pick up an image that will "Talk" to them - and tell them a story using Audio and Visual on a product, place, menu or event that the location would like to promote. Recently, at the RC Show in Toronto, Organic Interiors unveiled their "Talking" Table, partnered with 19 Crimes Wine. 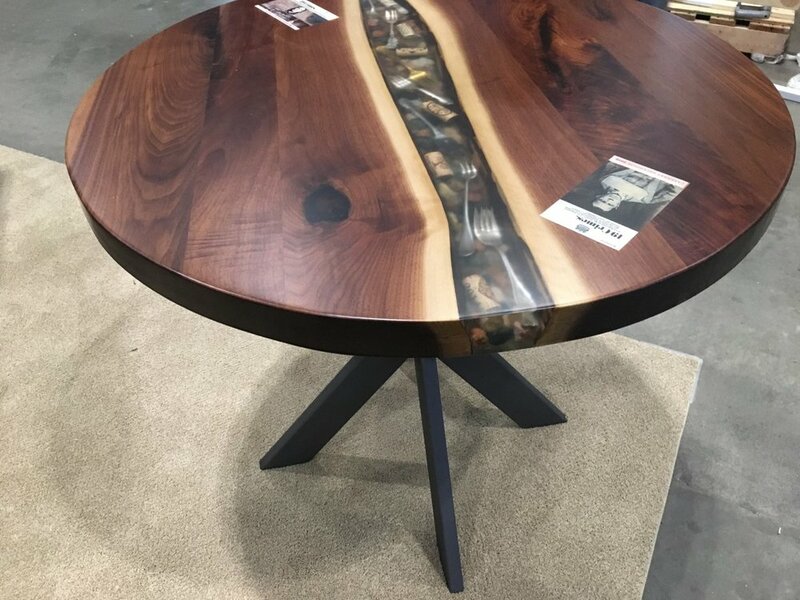 Jason Kuepfer, Master Creator at Organic Interiors, used an epoxy finish to not only embed Corks & Antique Forks into a Reverse Live Edge Black Walnut Restaurant Table, but he also embedded two of the 19 Crimes Wine labels under the durable Epoxy finish. This same technology can be used by restaurants to promote the "catch of the day" or other daily specials. It can also talk about the history of a building in which the restaurant or hotel is located. Furthermore, it could be used for movie theatres to capture the attention of their patrons by having movie trailers "come to life" with the scan of a phone! Augmented Reality, combined with stunning craftsmanship and creativity of Organic Interiors tables, make for a talking piece in any home, bar, office, hotel or restaurant. Contact Organic Interiors today to get a quote on your custom table or bar! Older PostFormaldehyde Free Furniture - What is Off Gassing?